Cats are good at figuring things out for themselves, especially the cats on this list of the smartest cat breeds in the world! Cats are naturally curious, great explorers, and good at making a toy out of anything. It’s not unusual for a cat to have more fun with the packaging that their toys came in than the actual toys. It’s similar to the way human children learn and play by experimenting and exercising their imaginations. Cats are able to entertain themselves, and they’re great at finding out how to get to new places. If you’re not careful, your cat might outsmart you sometimes. Here are some of the smartest cat breeds in the world. If the best way to learn is to play, Abyssinians are some of the best learners around. They’re one of the breeds that can actually learn to play fetch with small objects and will love doing it. The Aby, as the breed is affectionately called, is great at jumping and climbing. If you don’t have a ceiling-high cat tree, Abyssinian Cats will make one for themselves out of your bookcase, curtain, or anything else they can scale to the heavens. 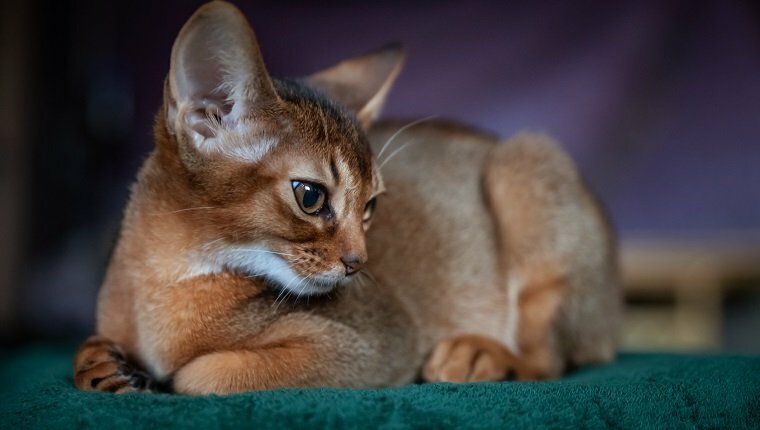 Abyssinians are also curious, and if anything has your attention, they might try to take it and investigate, which earns them the nickname “Aby-grabbys.” They love to be the center of attention and require constant stimulation. So if you’re the kind of person who is at work or school all day, the Abyssinian Cat may need a companion. Considering how Abyssinians are one of the brainiest cat breeds in the world, it wouldn’t be surprising if some were able to change the channels on a television. Like the Abyssinian, the Turkish Van loves to climb, but they aren’t very graceful. They’re big and clumsy by cat standards and tend to knock things over, sometimes on purpose just to see what happens. The Turkish Van can also learn to fetch and do tricks, and they have a love of water. Combined with their tendency to fall over, this makes the toilet a dangerous place for the Turkish Van to be hanging around. But they are smart enough to turn on faucets so they can drink or play in the water. This is a breed that exists in nature near Lake Van in Turkey, where the Turkish Van gets its name from. That means they are more than able to figure things out themselves, and they don’t like to be held. 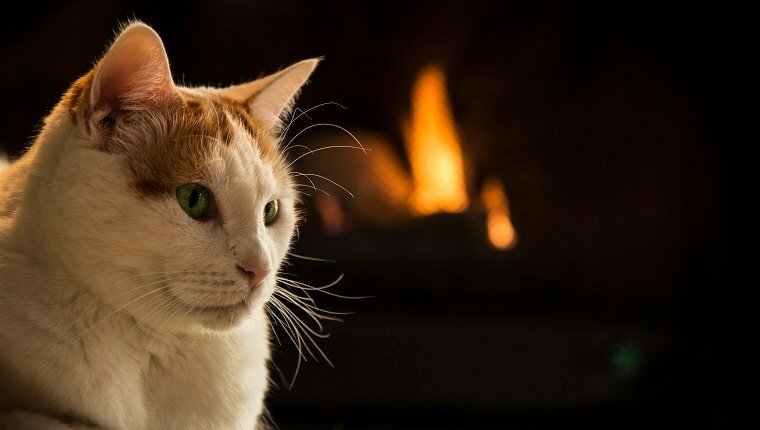 If you’re wondering what mood they’re in, the Turkish Van’s nose acts like a mood ring and turns red when they are upset. Best to let them explore on their own and give them toys that let them simulate pouncing on prey. The Turkish Van is mythologized as being a ratter on Noah’s Ark from the Biblical story of the worldwide flood. Having a love of water would make the Turkish Van a great candidate for surviving a flood, and their intelligence would make them excellent at keeping a big boat free of rodent stowaways. The flopped-over ears that give the Scottish Fold cats their name aren’t the only things that make this cat easily recognizable. 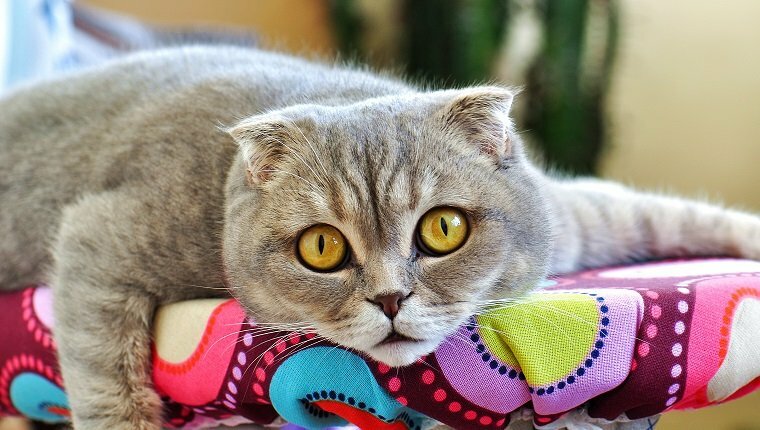 You’ve also probably seen plenty of pictures of Scottish Fold Cats on the internet with adorably expressive faces and their peculiar tendency to sit in odd positions, sometimes very much like a human. Maybe that’s because Scottish Folds want to blend in with humans, as they love being around people and doing stuff with them. Scottish Fold cats will join you to watch movies or television and will pay attention to what’s on the screen. Scottish Fold cats love to learn tricks, and they will expect you to play with them at length. Because of their need to be with human companions, it’s not best to leave them alone for too long. Scottish Folds prefer toys that keep them agile or puzzle toys that test their intelligence. The Scottish Fold has gained some fame in the past few years thanks to Maru, a viral YouTube sensation, with adorable videos of his penchant for trying to fit into any size of box. Maru the Scottish Fold cat’s combined videos have over 200 million views, and the internet loves his attempts to make a bed out of smaller and smaller boxes. These cats of Lady and the Tramp fame love to talk. 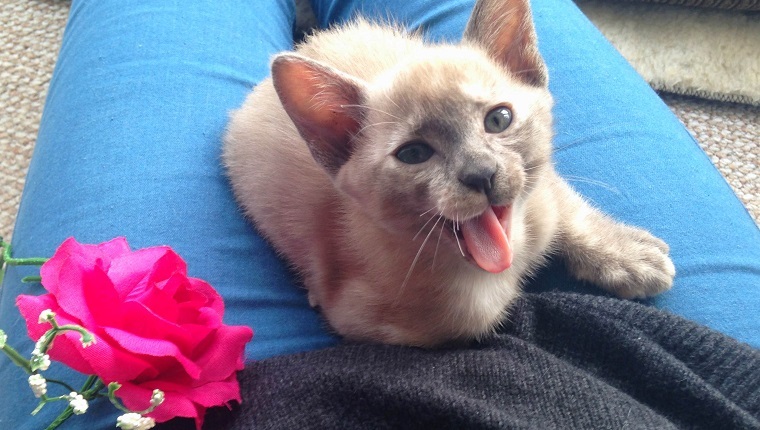 Siamese cats are loud, and they’re happiest when you chat with them. The Siamese is glad to follow you around and watch what you’re up to with an inquisitive eye, all the while being social and talkative. Being smart, Siamese cats get bored if their brains aren’t stimulated. So they should always be left with something to keep them busy. Puzzle toys will keep Siamese cats from making their own entertainment, which is a bad thing if you want to keep your tissue box or toilet paper roll intact. Siamese cats will let you know if they are bored or unhappy, and if you want to keep your sanity, you’d better give them the attention they crave lest they wake the neighbors with their caterwauling. They might be best off with a companion, if you’re not too creeped out by the twin kitties from the Disney movie. Do these people owe their success to their smart cats? Maybe not, but Siamese cats seem to come with success. The Siamese is the ancestor of the Burmese, and they definitely inherited their forbears intelligence. The Burmese also love to talk, but they aren’t as loud as the Siamese. Burmese cats grow attached to humans, so it’s best not to leave them alone. But they will be happy with another cat or a dog. 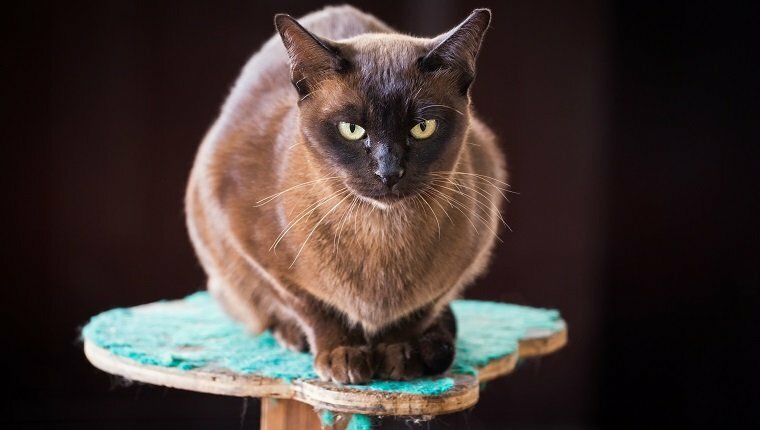 Teaching Burmese cats tricks will keep their mind working, and they’ll be happy to show off for your friends, as they love to be the center of attention. The Burmese can learn to sit, roll over, fetch, or even walk on a leash. Burmese Cats will follow you around everywhere, and their tendency to explore means they’ll know your house better than you do fairly quickly. They will want your attention quite often, and though male Burmese Cats are usually more docile and happy to sit in your lap for a bit, the females tend to be more demanding. The Burmese cat was a favorite of monks and kings in Siamese temples, and they were even mentioned in a 12th Century poem. Burmese Cats tend to live for quite a long time. A Burmese Cat in Australia lived to be 24 years old, which is the record for the breed. Rumor has it that bobtailed cats first arrived in Japan as gifts from the emperor of China. Over the centuries, the Japanese Bobtail defended the country’s grains and silkworms from rats, and they came to be seen as good luck charms. 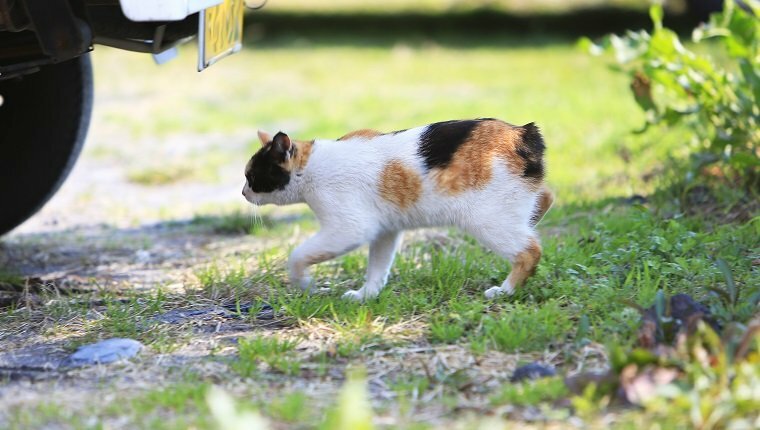 Since then, Japanese Bobtail cats have made their way into many homes around the world, and they delight their owners with their soft, chirping voices. In fact, they have quite an impressive vocal range, yet they aren’t obnoxiously loud. Still, they love when their humans want to carry a conversation. Japanese Bobtails have a fondness for playtime. They’re happy to play in water, so aquarium owners should beware. They also enjoy a good challenge from a puzzle toy and will have a blast with a game of chase from a fishing pole toy. Japanese Bobtails also grow quite fond of their humans and are happy to be perched on a comfy lap. Although they don’t like to stay home alone for long periods of time, they travel easily. So if you plan to leave the house for a while, just bring your Bobtail buddy along. What happens when you mix the intelligence of the Siamese and the Burmese breeds? You get the smarty-pants Tonkinese. Tonks, as they are nicknamed, need attention and will follow you around or even ride on your shoulder. Tonkinese cats are happy to meet new people and are quite social. That’s why they shouldn’t be left alone for too long. 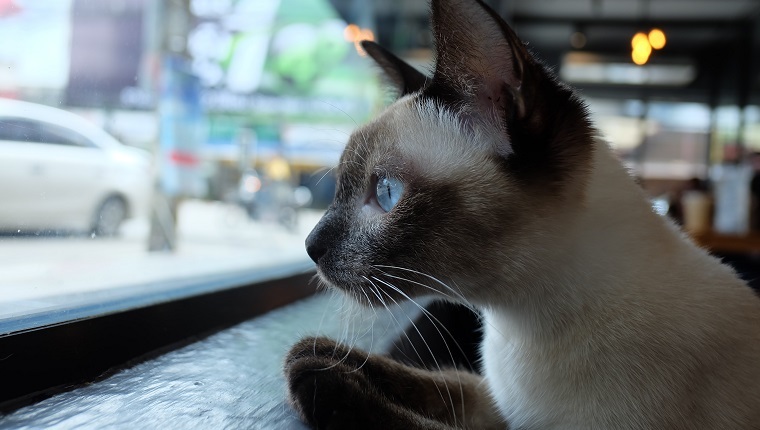 The good news is that Tonkinese cats are happy with any kind of companion, whether it’s a cat of another breed or even a dog. They’re good at dog games, too, like fetch, and will even walk on leash. Tonkinese cats also like to talk, though they aren’t quite as loud as their Siamese parents. Basically, if you want a dog, but your apartment only allows cats, the Tonkinese is the breed for you. They’re very smart, so puzzle toys won’t keep them busy for long. It’s important to keep rotating a Tokninese cat’s toys so they stay busy. The Tonkinese cat holds the world record for largest cat litter ever, with 19 Tonkinese kittens delivered from one exhausted mother. 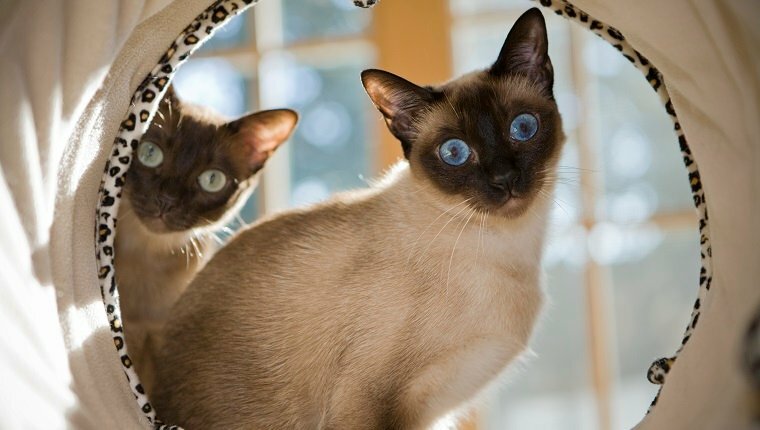 If you own a Tonkinese, you may notice their coat color is different from what you expect. That’s because the Tonkinese will change their fur color based on climate, as cooler areas cause the Tonkinese to produce an enzyme that darkens their fur. They’re so smart, even their bodies can learn to adapt to their surroundings. These leopard-like beauties are highly sought-after. A British woman paid over $50,000 for a Bengal cat in 1990, and with their intelligence, personality, and looks, it’s no wonder why. Bengal cats are excellent at learning tricks, and they’re great with their paws. This can lead to trouble, as Bengal cats have a penchant for turning off light switches, playing with electronics, and causing mischief. Bengals love water and will follow you into the tub or shower if they can. But their love of water and dexterous paws make them a nightmare for fish in aquariums or backyard ponds. 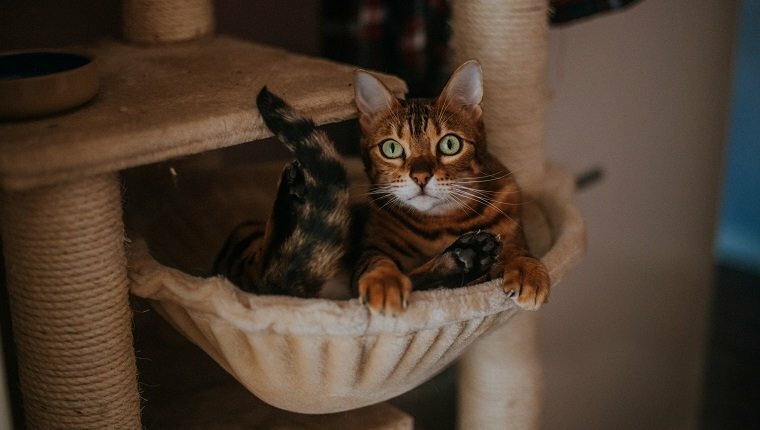 Bengals love to climb like their leopard ancestors, so they will definitely need a cat tree if you’d prefer not to have curtains full of holes. Bengal cats are very popular and many famous celebrities own or have owned Bengals. Kristin Stewart of the Twilight movie series is a Bengal lover, as well as Ian Anderson of Jethro Tull, Bruce Springsteen, Kevin Bacon, and Sean Connery. These smart cats clearly know how to keep friends in high places. Intelligence isn’t the only thing on these cats’ side. Cornish Rex cats also have excellent jumping abilities and long toes that let them hang on to objects, open doors, and raid cabinets. If you want to hide something from the Cornish Rex, make sure you do it when they’re not looking, as they’ll easily be able to figure out a way to retrieve it. Speaking of retrieving, Cornish Rex cats are great at retrieving toys and playing fetch. They’re very quick and able to move around corners easily. Cornish Rex cats love people and are always looking to give affection or for a lap to sit on. Their friendly demeanor and intelligence makes them fairly easy to train for therapy work, and their love for being held by humans makes vet visits a bit less stressful. The Cornish Rex is another cat who’s great for couples who can’t decide whether they want a cat or a dog. 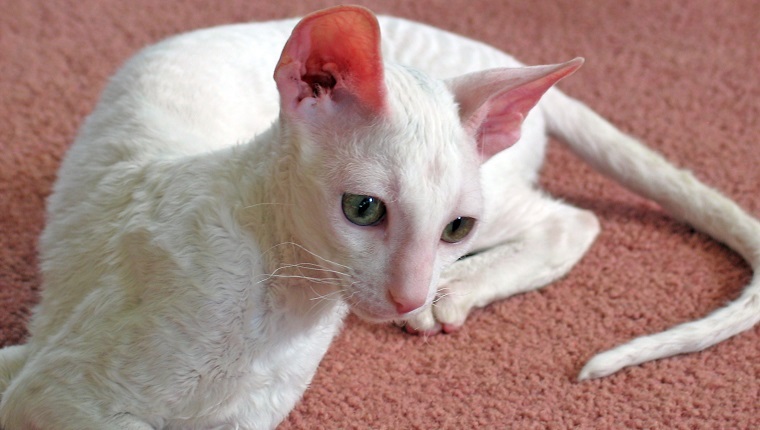 Radio host Robin Quivers mentioned her Cornish Rex Cats on The Howard Stern Show all the time, and fashion designer Michael Kors owned two of these brainy cats. Singapura cats may have come from the Abyssinian and the Burmese, and a DNA study found very little genetic difference from the Burmese. Still, they’ve earned recognition as their own breed, and they share the intelligence of their ancestors. The most notable difference is how tiny Singapura cats are. In addition to being one of the smartest cat breeds in the world, they are also the smallest cat breed in the world. Despite their small size, Singapura cats have a big personality and their hyperactivity makes sure that you know they’re there. Singapura cats may surprise you by jumping from a high place onto your shoulder as you walk by. Singapuras are quite curious and always busy. They may stop once in a while to sit on your lap, but they’ll be in a hurry to get back to whatever they’re up to, and they’ll keep that playful nature even as adults. 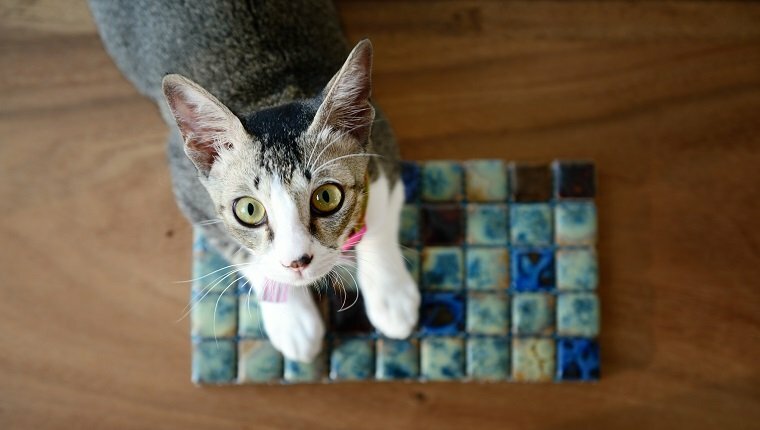 Theses tiny cats love people and other pets, but make sure there are enough of both around to keep your Singapura cat entertained. The Singapura cat’s adorable tiny size and big intelligence has increased their popularity in North America, which is a good thing for their feral relatives back in Singapore. The Singapura’s cousins used to be exterminated as pests, but Singapore has recently adopted the Singapura cat as the country’s official mascot to draw in tourists. Now the Singapura is celebrated in their homeland. We’re all for giving these intelligent felines a place of honor. Think your cat is one of the smartest cats in the world? Should any other breeds be on the list? Let us know in the comments below!